Posted April 3rd, 2019 by alexa & filed under Weddings. I was delighted when Catherine and Jack asked me to be their Fulham Wedding Photographer last year. 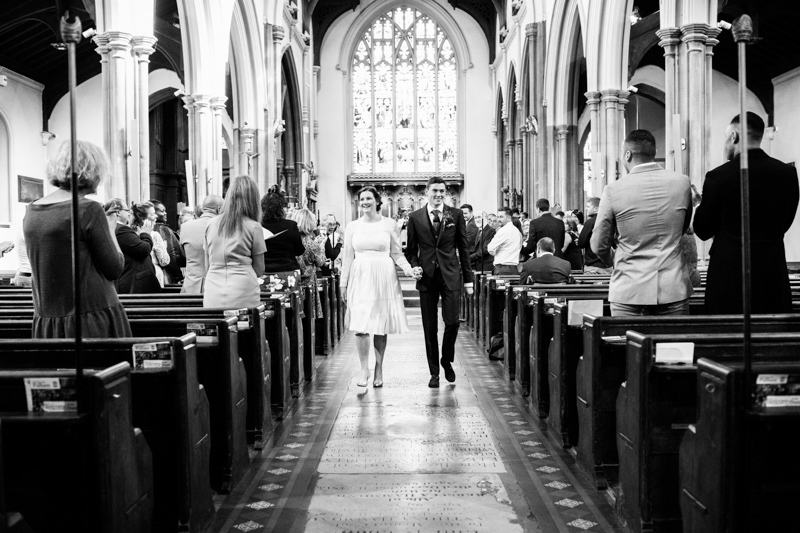 They were due to be married at the beautiful All Saints Church Fulham, a church I know very well. After the wedding ceremony the plan was to photograph some beautiful wedding portraits of the newlyweds in the grounds of Fulham Palace. Then the venue for the reception was the attractive garden of the All Saints Church Vicarage. This Fulham wedding was happening in October and as the couple were keen for the reception to be outside we were hoping for good weather. And we certainly got lucky as the day was absolutely glorious! There was warm sunshine from the beginning to the end of their wedding day. A relaxed day for this Fulham Wedding Photographer! The bridal preparations took place in the All Saints Vicarage. Then we made the short walk to All Saints Fulham Church. It’s quite unusual to be able to walk between all the venues on the wedding day but it does make for a very relaxed day. Not just for the bride, groom and guests but also for this London wedding photographer! All Saints Church Fulham is absolutely stunning and well worth a visit if you don’t already know it. It’s situated next to Putney Bridge and Bishops Park by the River Thames and is stunning both inside and out. Catherine and Jack’s wedding ceremony was absolutely beautiful. The church was full of family and friends and had a wonderful atmosphere. They’ll be more photos of the ceremony and reception to follow in a future blog. For now I hope you enjoy this lovely wedding moment of the new Mr and Mrs leaving the church excited about the wedding day celebrations ahead of them. If you’re looking for a Fulham Wedding Photographer, please do get in touch. Whether your wedding’s going to be at All Saints Church Fulham, Fulham Palace, the Hurlingham Club or any of Fulham’s other amazing venues I’d love to meet you and have a chat about your wedding day plans.